Crisponi syndrome is a very rare disease that was described in 2 patients in 1978 and next in 8 patients in 1996 (1,2). This syndrome is also called cold-induced sweating syndrome, or CISS. Because Crisponi syndrome was first described recently and is very rare, there are relatively few resources dedicated to it on the internet. A relatively limited number of cases have been reported, but the condition appears to occur worldwide. In all cases described to date, the syndrome was evident at birth. Its most obvious characteristic is contractions of the face that are triggered by crying or in response to being touched for feeding or changing diapers (see photo at right). This trait can create feeding difficulties, and many infants must be tube fed. Infants may also drool excessively during periods of facial contractions. As an infant relaxes, the contractions begin to disappear and the drooling also eases off. This problem appears to disappear with time. Hyperthermia (high body temperature) is an important problem that occurs very frequently in Crisponi syndrome patients. Temperatures have been recorded as high as 42°C (107.6°F). Hyperthermia can present around the time of birth or may not occur until an infant is a few weeks old (2,3). This problem can lead to brain damage and death. A large majority of patients with Crisponi syndrome sweat excessively in a cool environment. They may not sweat or sweat very little in a warm environment or when stressed. This condition creates heat intolerance in many patients, and puts them at risk of overheating in warm or hot weather. Excessive sweating can be unpleasant in cool weather and may create chills. Sweating has been treated with clonidine (4,5), monoxidine (6),	or transdermal scopolamine (4). Two types of Crisponi syndrome/CISS have been described. They have been called CISS types 1 and 2. The two are indistinguishable from a clinical standpoint, but are caused by mutations in two different genes (CLCF1 and CRLF1; 4). For all practical purposes known to date, they are the same syndrome. In making a diagnosis, Crisponi syndrome should be distinguished from Stüve-Wiedemann syndrome (SWS). A chief difference between them appear to be the presence of bowed long bones in SWS, but not in Crisponi syndrome (3). In addition, the two diseases are caused by mutations in different genes (CLCF1 or CRLF1) in the case of Crisponi syndrome and LIFR1 in the case of SWS). Another disease that should be considered is Freeman-Sheldon syndrome. Crisponi syndrome can be confirmed by testing for mutations in the genes CLCF1 or CRLF1. For a list of labs that perform testing, please see the link at right. 1. Sohar E et al. (1978) Cold-induced profuse sweating on back and chest: a new genetic entity? Lancet 312(8099):1073-1074. Abstract on PubMed. 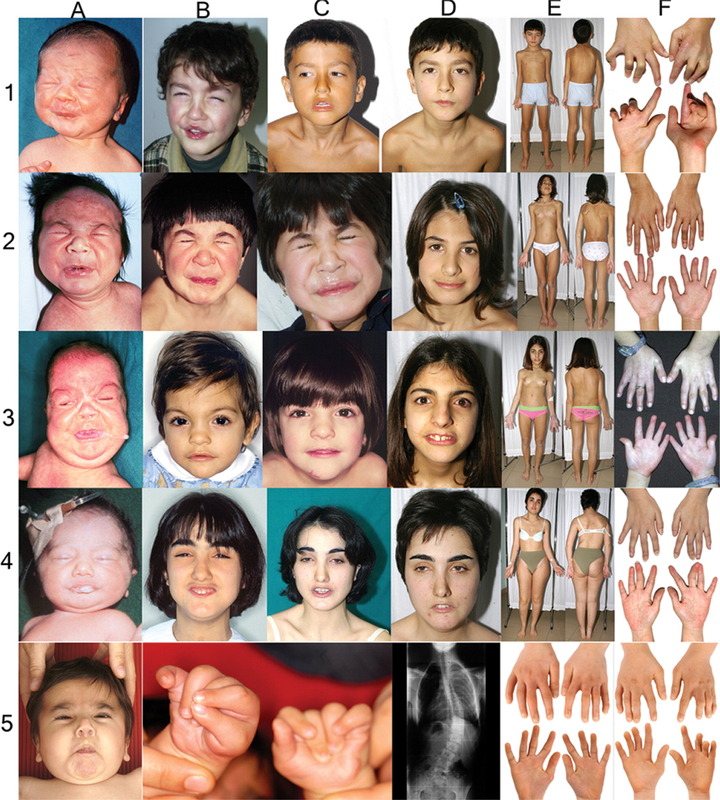 2.Crisponi G (1996) Autosomal recessive disorder with muscle contractions resembling neonatal tetanus, characteristic face, camptodactyly, hyperthermia, and sudden death: a new syndrome? Am J Med Genet 62(4):365-371. Abstract on PubMed. 3. Crisponi L et al. (2007) Crisponi syndrome is caused by mutations in the CRLF1 gene and is allelic to cold-induced sweating syndrome type 1. Am J Hum Gen 80(5):971-981. Full text on PubMed. 4. Hahn AF et al. (2006) Cold-induced sweating syndrome. A report of two cases and demonstration of genetic heterogeneity. J Neurol Sci 250(1-2):62-70. Abstract on PubMed. 5. Hahn AF et al. 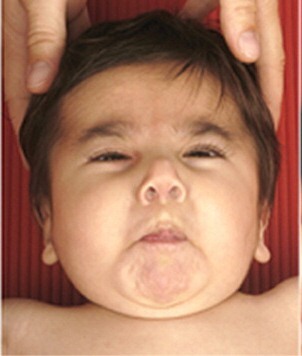 (2010) Cold-induced sweating syndrome: CISS1 and CISS2: manifestations from infancy to adulthood. Four new cases. J Neurol Sci 293(1-2):68-75. Abstract on PubMed. 6. Herholz J et al. (2010) Successful treatment of cold-induced sweating in Crisponi syndrome and its possible mechanism of action. Dev Med Child Neurol 52(5):494-497. Abstract on PubMed. and copyright information, click here.